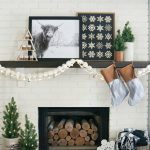 I’m so excited to finally be sharing my 2015 Christmas Decor with all of you, better late than never right?! This year I started out feeling so on top of things and then all the sudden I wasn’t, and time has gotten away from me…and that’s okay because I made a promise that this year I would work less during the holidays and enjoy my family more. 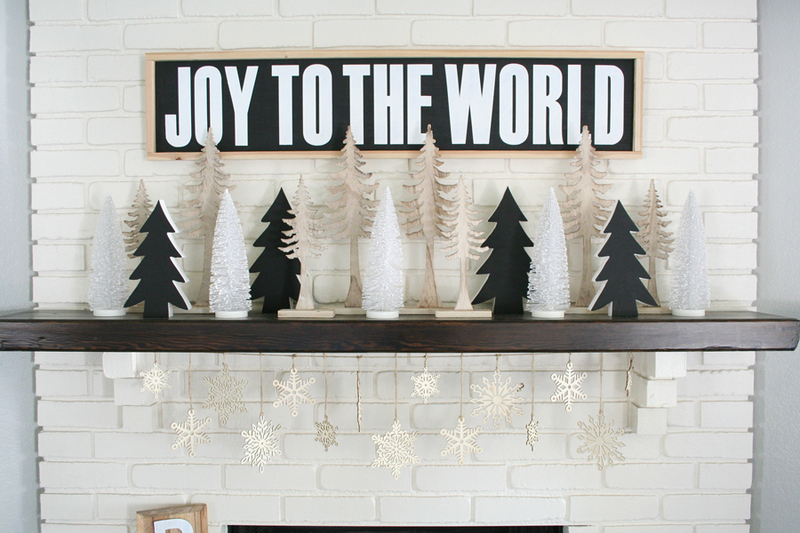 So even though I’m a little behind schedule wise with sharing this, I hope you love my Black & White Christmas Mantel as much as I do. This year as you can tell I wanted to stick with a neutral color palette like with my previous holiday decor this year. 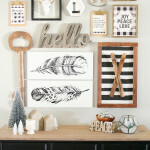 I’m obsessed with the black, white, and pops of natural wood tones. I also had no real “theme” other than color to my decor this year. I wanted it to be just things I loved and kind of simple. Let’s start with the sign! I love this sign so much guys! It turned out exactly like I wanted. I knew I needed something long, this sign is 4 ft. long and about 12″ tall. I used 10″ pine common board to create my sign by painting the wood white, then applying my vinyl stencil cut with my Cricut Explore. Then I painted over the stencil with black paint and let it dry. When I removed the stencil I added my pine 1 x 2″ wood trim using my Ryobi airstrike. Love that thing. 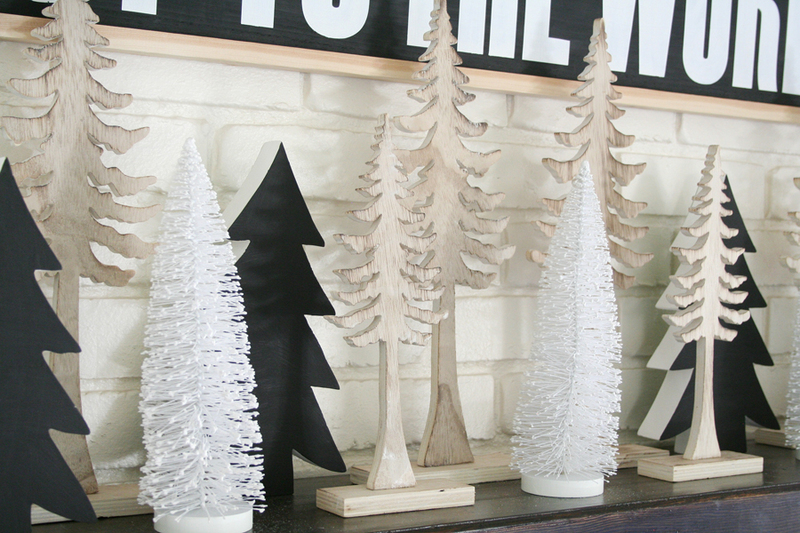 Since last years decor, I’ve been thinking of having a mantel full of trees, different shapes and textured trees. I snagged those big white bottle brush trees after Christmas last year at Target. 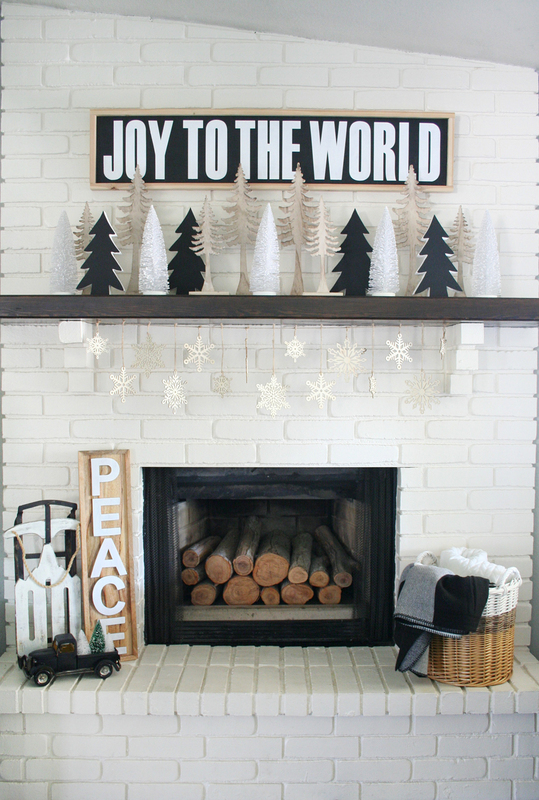 The natural colored Wood Trees are from World Market, and I also used them in my Merry & Bright Holiday Mantel Decor. 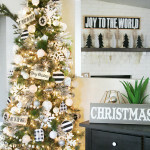 The black chunky wood trees are from Hobby Lobby, they were originally green front and back. 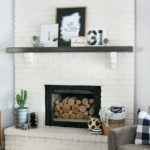 I painted them black to match my decor with some DecoArt Multi-Surface paint. I just made a forest of trees on my mantel and that was it. I tried adding big round bulb lights but it just wasn’t working and looked too cluttered and odd so I removed them. 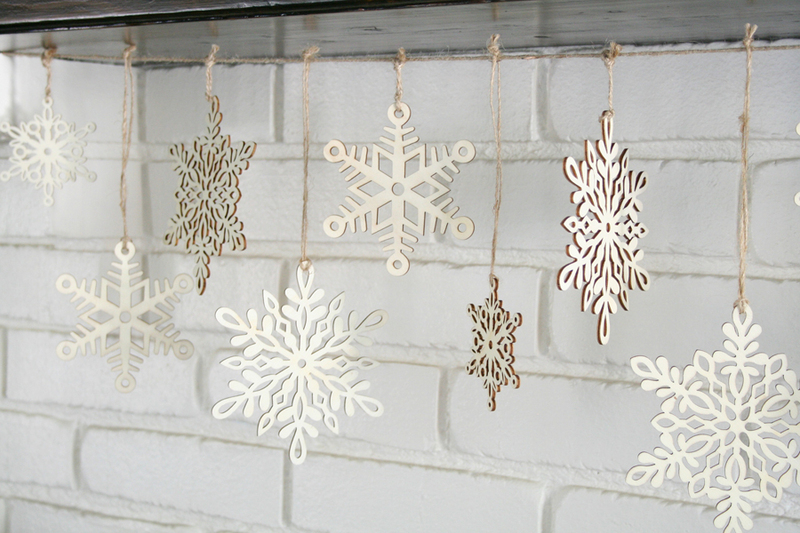 I added this pretty Wood Snowflake Garland from World Market, I love how it looks against the white brick. 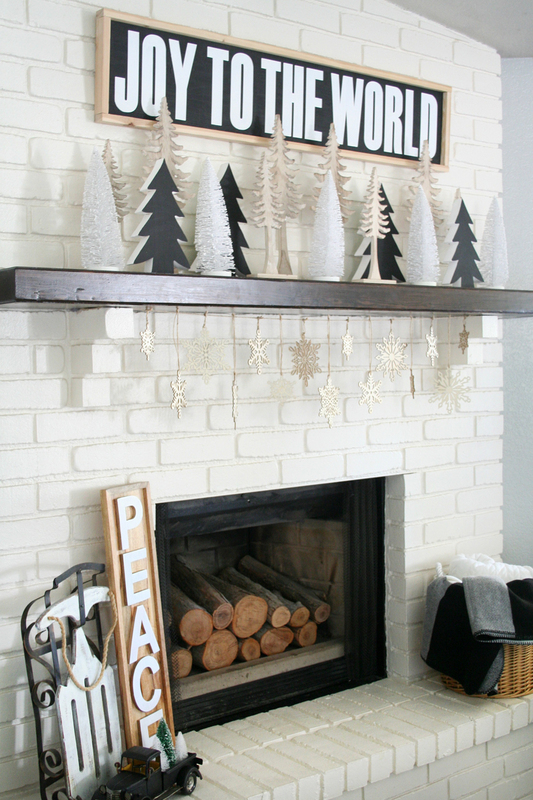 I used this garland in my Merry & Bright Holiday Entryway as well. 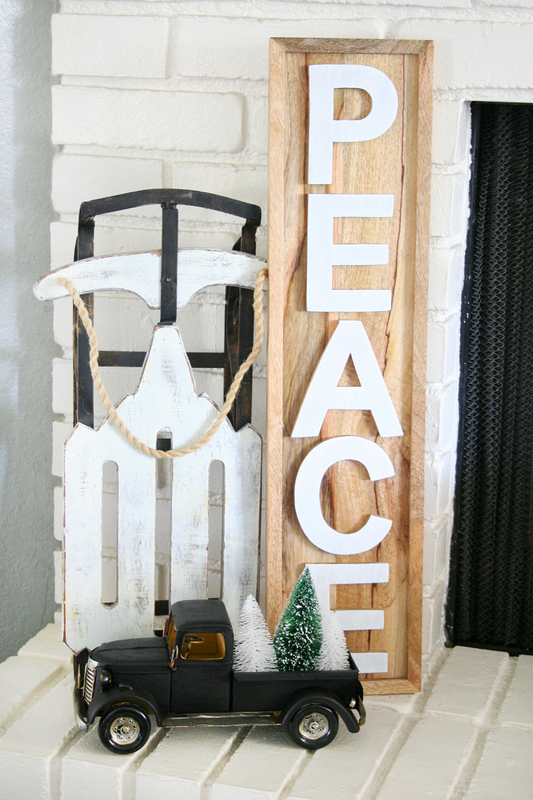 The wood peace sign is a fun find from HomeGoods, it was originally all wood and I painted the letters white to make them stand out better. I’m so glad I snagged this sign, it was only $12 and I love the wood. I paired the sign with my small sled and my vintage inspired tin truck. I threw some more bottle brush trees into the bed of the truck, I love it so much. 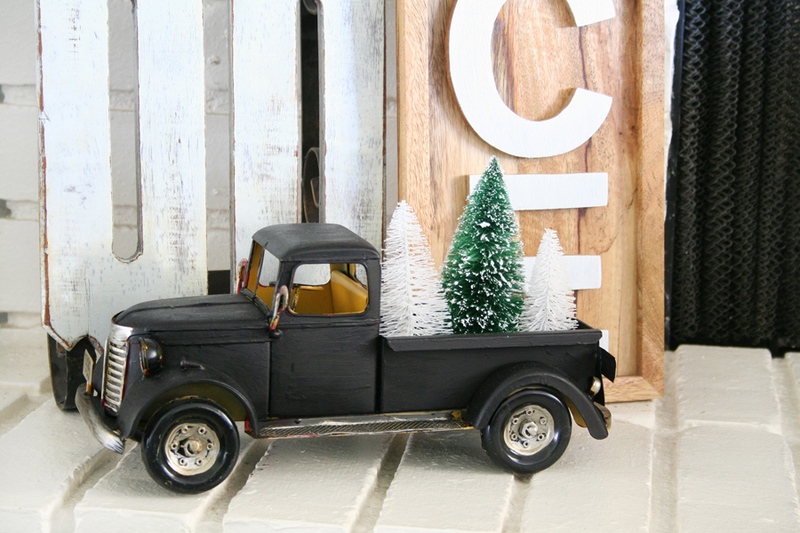 Do you remember that truck from last year’s decor? It was red, so I just grabbed my DecoArt Multi-Surface paint and transformed it to match this year’s decor. 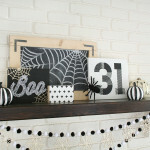 I love how this mantel decor turned out. The contrast of black and white is always so pretty to me, I hope you love this as much as I do. Just for fun I thought I’d show you a little wall decor just off my fireplace. 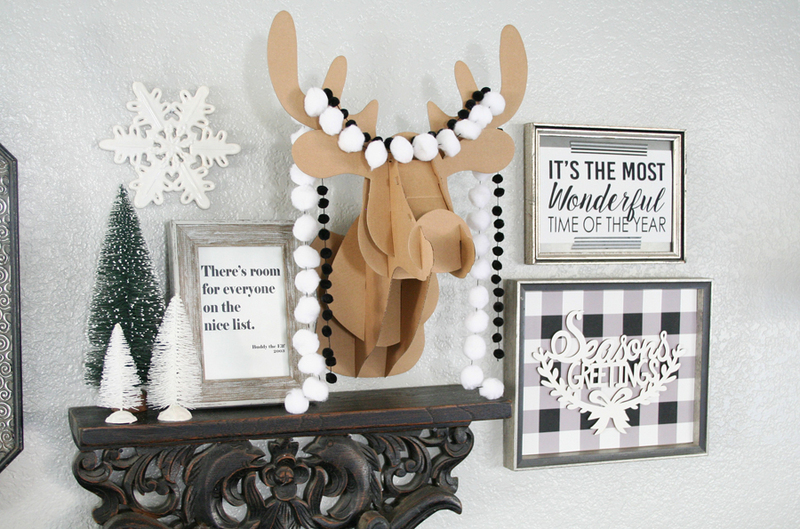 I love that cardboard stag head from Target’s dollar spot, I added some fun pom-pom trim to dress him up. The “ELF” printable was something I designed. I added some buffalo check paper to a frame and then put a cute wood laser cut design from Michaels on top. I know that little shelf is kind of odd, but I’ve had it for so many years and for some reason I just can’t part with it. Someday I hope to replace it with something much more my style. Until then, it stays.